When you are on the move and need to cook fast nothing can be as useful as a pressure cooker. It is an extremely safe utensil that helps you to cook fast and eat healthy. When you have a hectic schedule and you don’t have enough time to cook for a while, nothing can be as helpful as a pressure cooker. In fact pressure cooker does not let you compromise with the taste and nutrients either. It is the only utensil that will never let you compromise with the food value. But no matter even if you use the products of top pressure cooking brands, some mistakes can ruin the whole process of pressure cooking. Take a look of the mistakes and avoid them while cooking. If you cook in your old pressure cooker or choose a cheap one, there are higher chances that you will have issues with the locking system. The locking mechanism or the rubber gasket keeps the lid at the right place when cooking is on process. Make sure that the steam does not come out from below the lid. It will lengthen the cooking process. But these days the pressure cooker products won’t start working until the proper locking system are not at place. Excess liquid can ruin your cooking when you are using a pressure cooker. Pressure cooker can evaporate less liquid than a pressure cooker can. So, if you are going to add up quite a lot of water and sauce it is going to spoil your cooking. In fact more moisture will turn the food in soggy, tasteless material. It also makes the nutrients leach out in the gravy. The biggest and most common mistake that everyone commits while cooking is the excess cooking time. When you are cooking in a lidded pot it is obvious that it will take less time than open pan cooking. 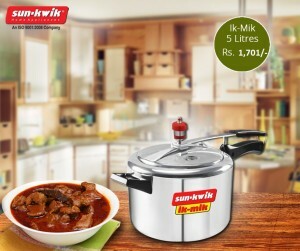 In fact when the food is overcooked in pressure cooker, it makes the food lose its food value and nutrients. It also makes the cooking a messy affair as the nutrients will ooze out of it for over cooking. When you are buying a pressure cooker you need to think about the right size that is required for it. The standard size is 6 to 8 quarts. But if you choose the wrong one it will be difficult for you to cook. Either the food will remain uncooked, or the food will become will become overcooked. 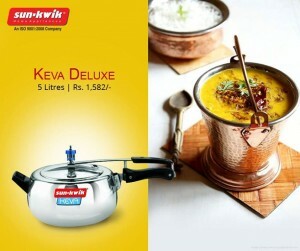 Choose the right one and you will get the perfect experience of cooking.